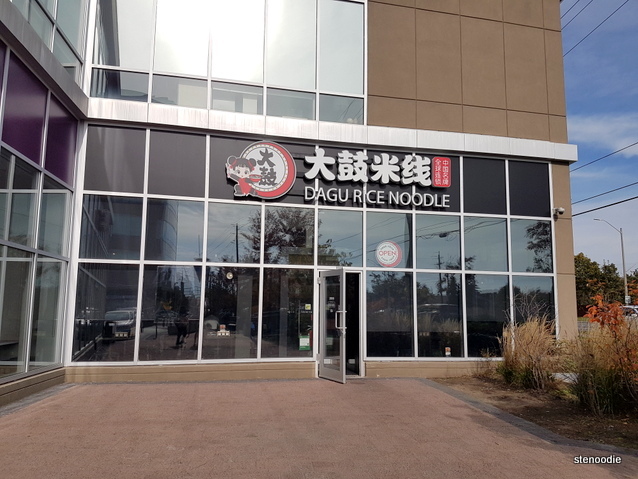 After a half day of work, I met up with my mom and we went to Dagu Rice Noodle (located at 20 Gibson Drive, Unit 111A) in Markham. This used to be the place of Spicy Mafia. After I informed them I was there for the blogger’s tasting, the server sat us down at one of the larger tables next to the windows. There were a lot of people dining in for lunch. 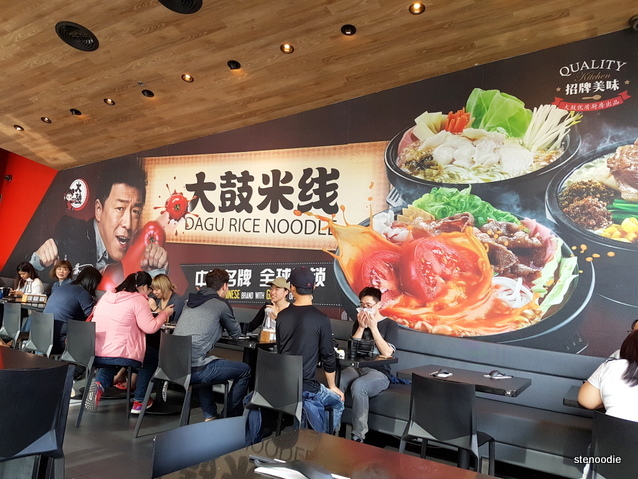 I liked their large mural which displayed the logo for Dagu Rice Noodle and their featured rice noodle bowls. It was such a nice decor for the place. 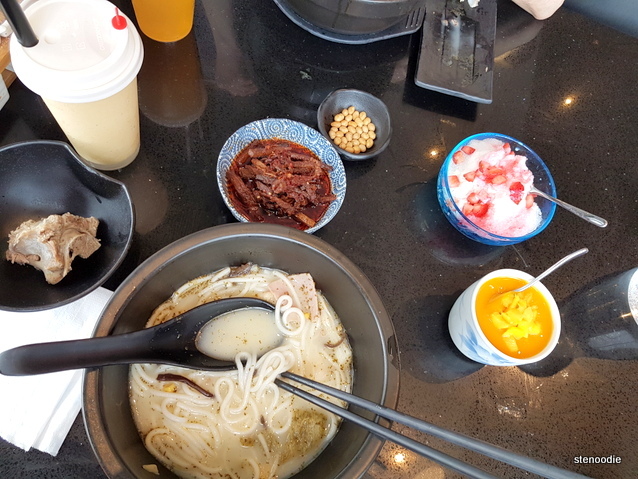 Dagu Rice Noodle is a very popular rice noodle franchise originating from China. 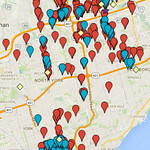 This is one of two locations that they currently have in Toronto (the other one is located in downtown Toronto) and will be opening a third one in Scarborough soon. I was excited to try this out! 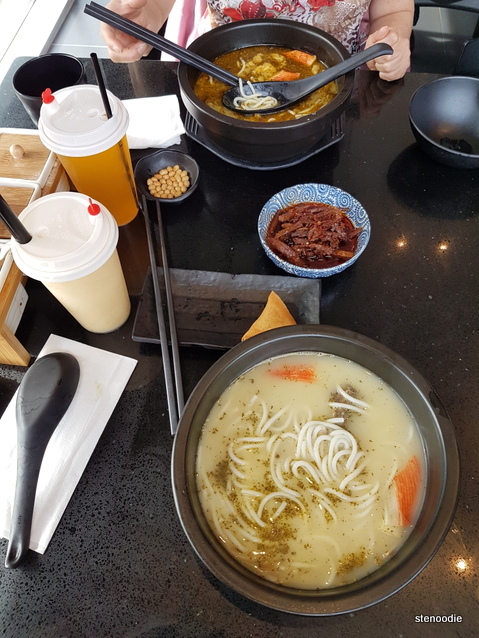 They boast that their soup bases contain zero MSG, arrive hot in the 300° F temperature range, and offer unlimited rice noodle refills. 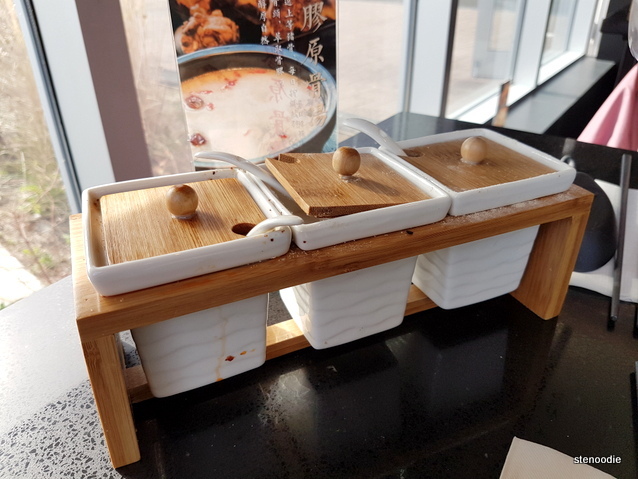 On our table was a selection of spicy sauce and condiments if you wanted to spice up your bowl of noodles. 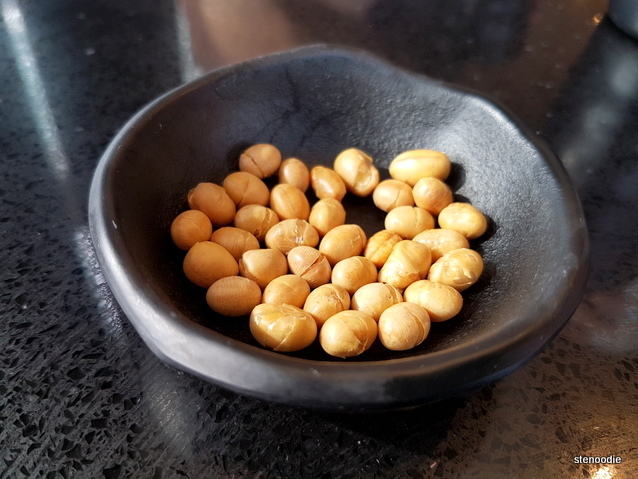 We were given some roasted nuts too as a pre-starter. 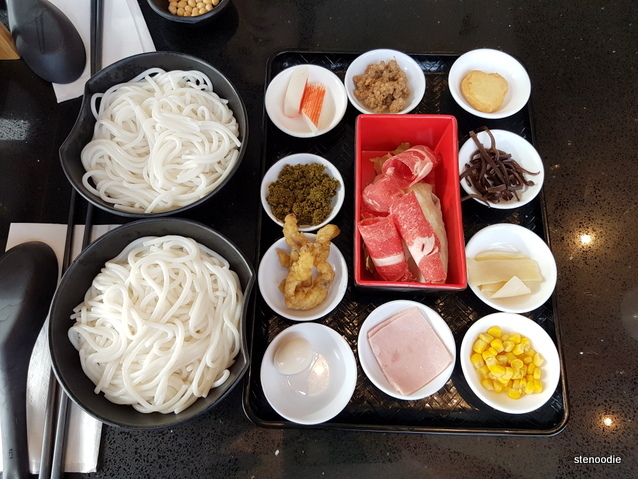 We were first given the tray of toppings for my bowl of cross bridge noodles and also two bowls of rice noodles that were already cooked. Before the steaming hot bowls of soup came, our starters and drinks arrived. 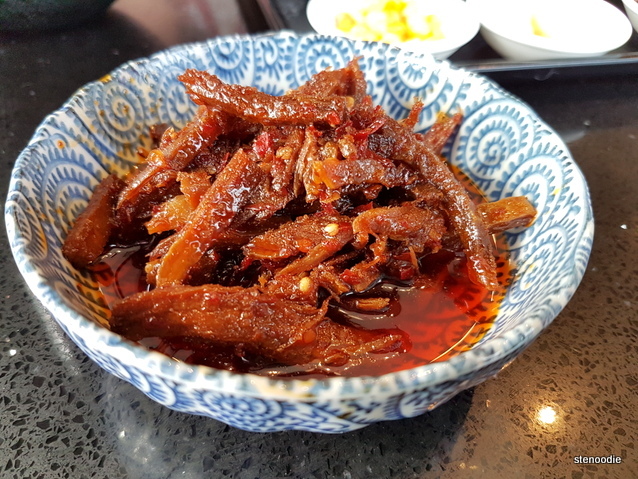 The Beef Jerky Soaked in Szechuan Chili Sauce came in a pretty blue bowl. 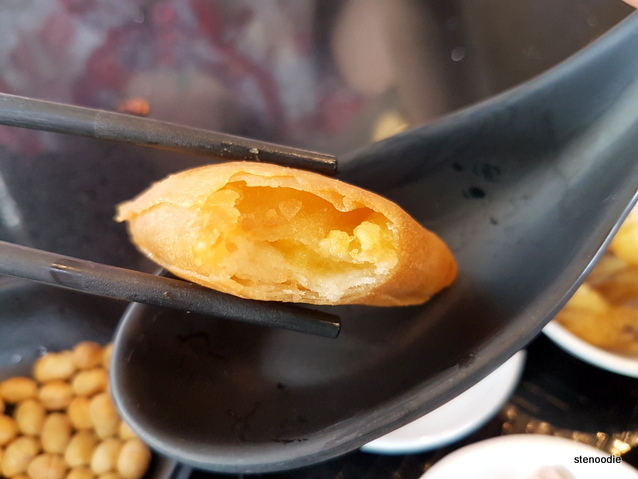 The Crispy Golden Durian Pastry arrives in threes. 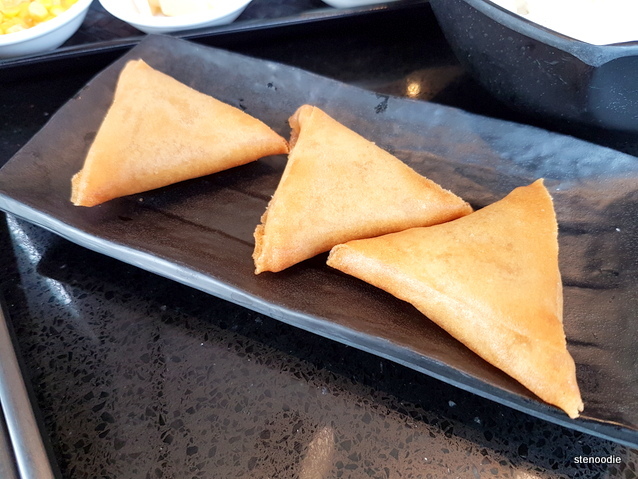 It was a really crispy triangle with smooth durian cream inside! 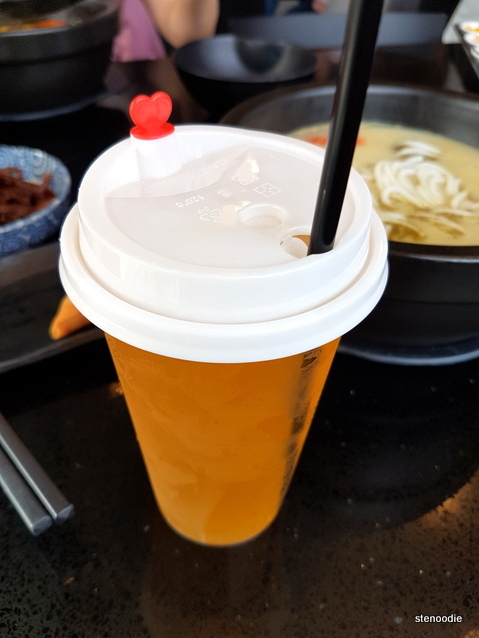 The medium size cup of Mango Yakult arrived in a plastic coffee cup-like container as did the Passionfruit Green Tea. 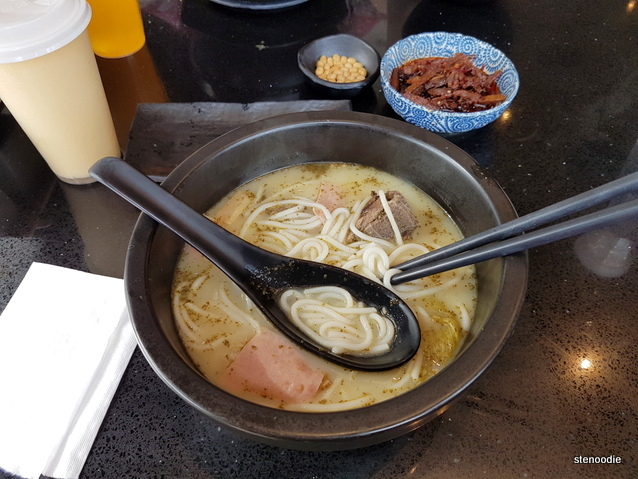 When my bowl of hot soup arrived, I poured in all of the ingredients on my tray starting with the meats into the bowl followed by the bowl of pre-cooked rice noodles. 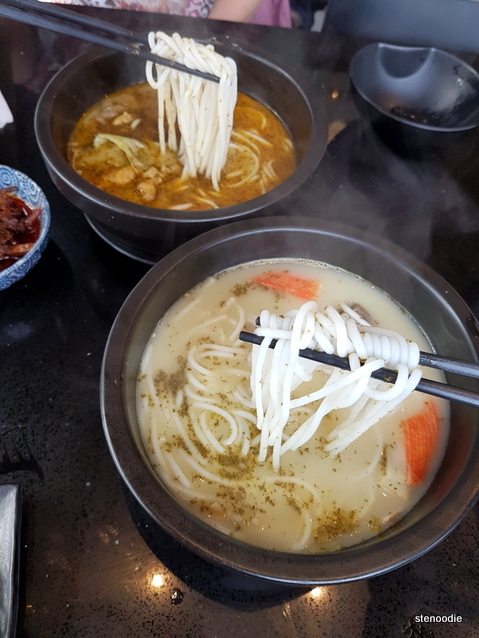 “Crossing the Bridge Noodles” have this specialty where all of the ingredients are then cooked together with the rice noodles in the hot soup. I’ve had it before many times. 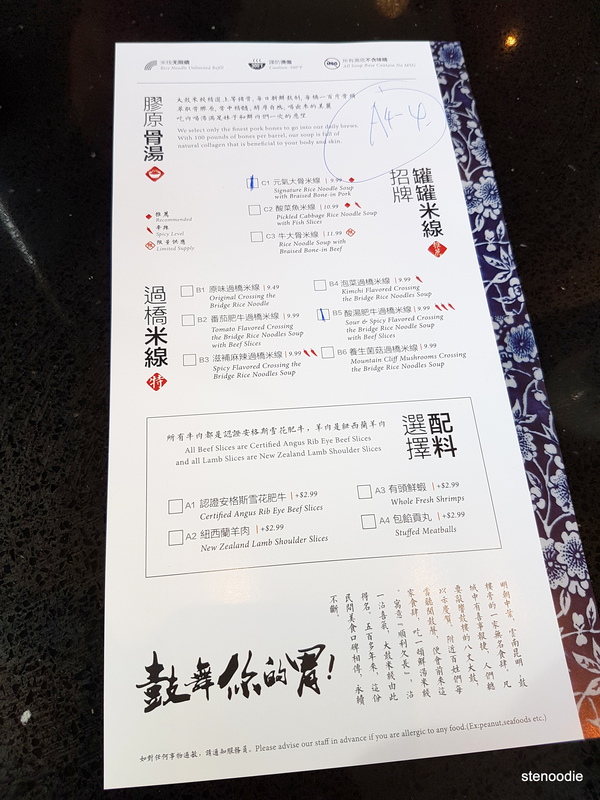 Mine was the Signature Rice Noodle Soup with Braised Bone-in Pork. 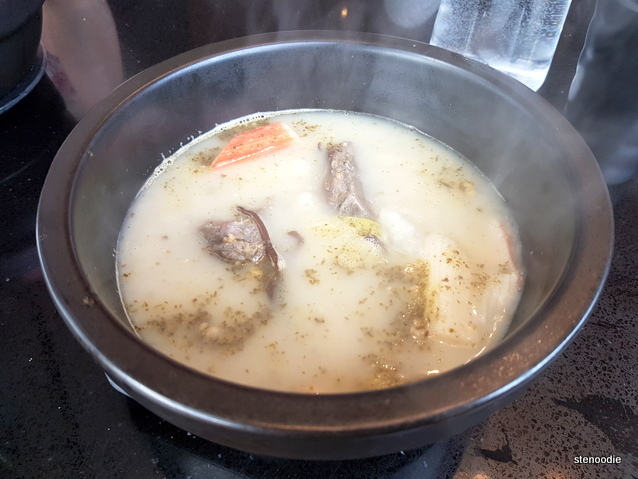 I liked my soup base since it was so light in flavour but still very fragrant and tasty. The braised bone-in pork was meaty. What I liked most were their rice noodles. It was firm enough for my taste and had a slight bounce in it. Now I understand why they are a popular franchise in China. Look at how huge their spoon is! 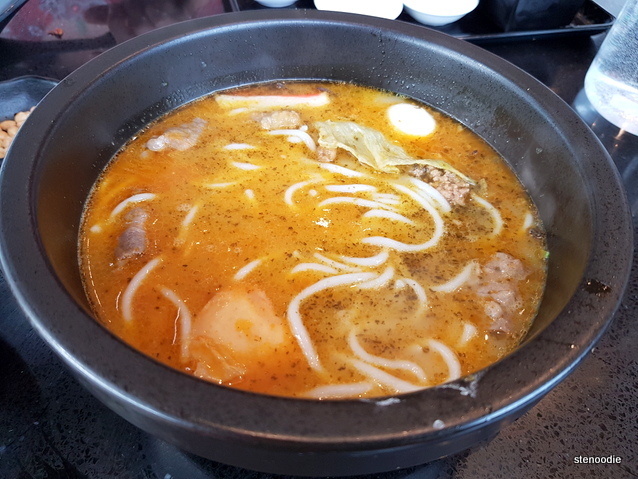 My mom’s bowl was the Sour & Spicy Flavoured Crossing the Bridge Rice Noodle Soup with Beef Slices. This came already stocked with the ingredients in it so only the bowl of pre-cooked rice noodles had to be added in. 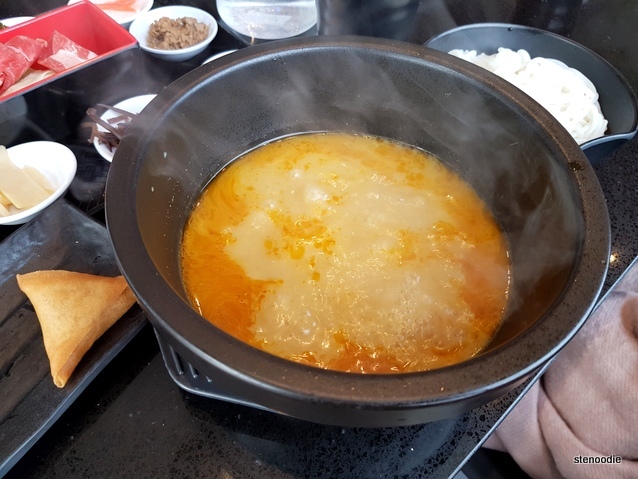 This soup base was indeed a bit sour and spicy; true to its name. It wasn’t very, very spicy though so don’t worry if you don’t have a big tolerance for spice. With the noodles added in! While we were in the middle of our meal, our desserts arrived! 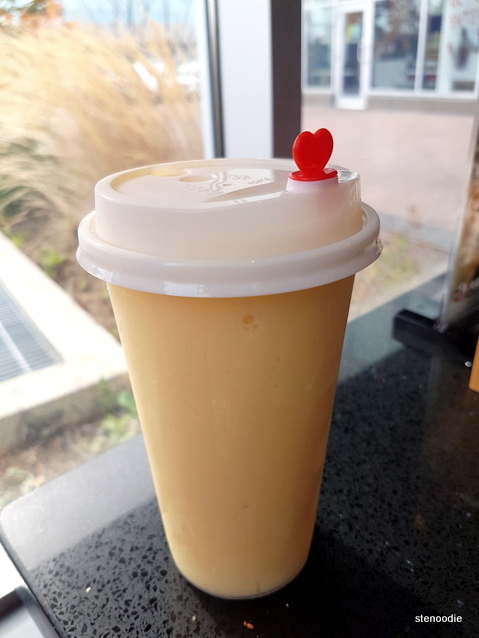 We had the Custard with Fresh Mango and Crushed Ice with Fresh Strawberry. Desserts at the same time as the mains? Both desserts looked so good. 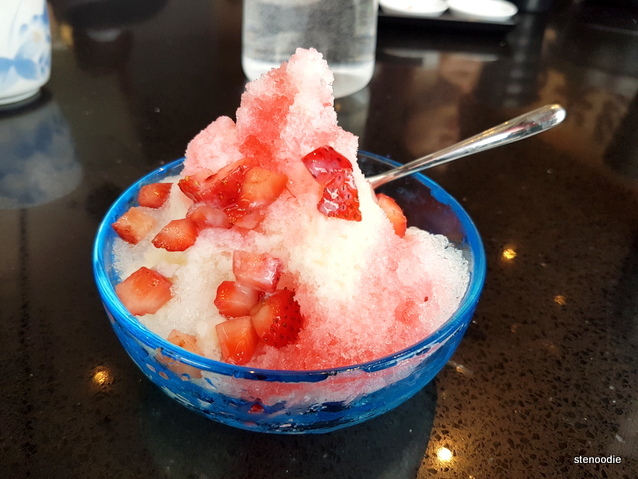 I really liked the Crushed Ice with Fresh Strawberry. 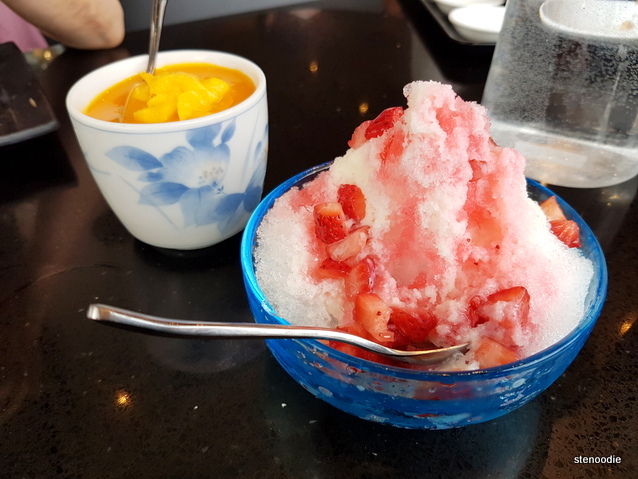 The strawberry syrup that they used was sweet but not too sugary which made it very refreshing to eat with the crushed ice. The strawberries were individually cut up and frozen. 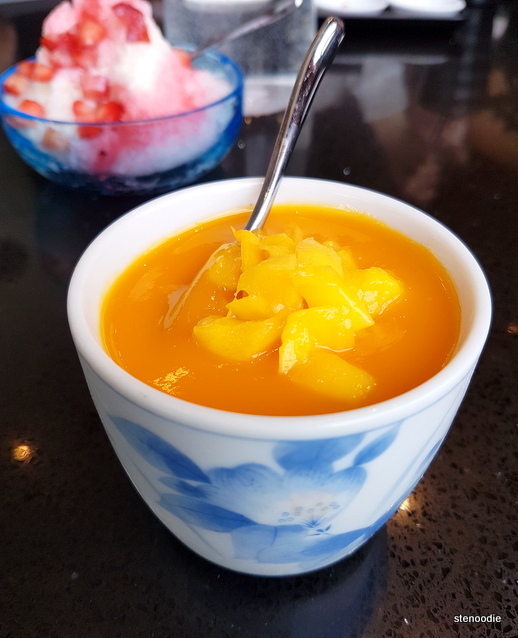 I also liked the Custard with Fresh Mango. The custard was very smooth like panna cotta. There was more than enough mango sauce on it too. This restaurant was very packed at the mid-point of our meal. There were so many people coming in for lunch on a weekday that a line started to form and there were a good number of people standing outside. Wow! That was really impressive. 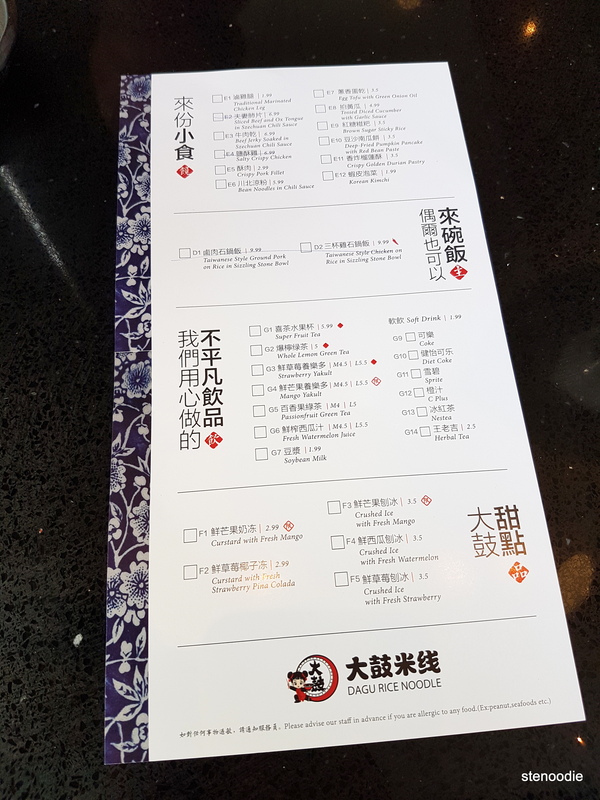 I haven’t seen many restaurants in Toronto have a line-up for lunch. 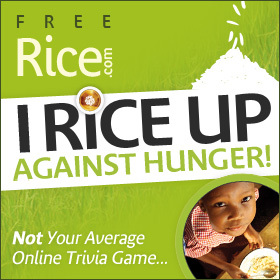 It’s great to see that the word about this rice noodle franchise is out. 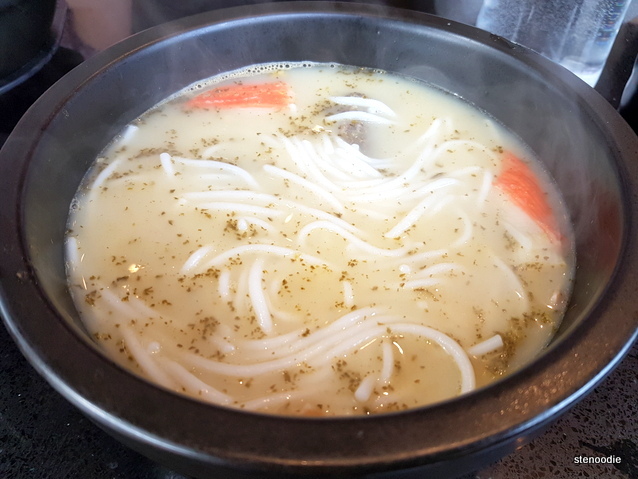 FTC Disclaimer: Although Dagu Rice Noodle provided the meal free of charge via winning an online contest, the opinions expressed here represent my own and not those of the company or contest holder. This entry was posted in Complimentary Adventures, Food and tagged 20 Gibson Dr Unit 111A, Beef Jerky Soaked in Szechuan Chili Sauce, Chinese, Crispy Golden Durian Pastry, crossing bridge rice noodle, Crossing the bridge noodles ingredients, Crushed Ice with Fresh Strawberry, Custard with Fresh Mango, Dagu Rice Noodle, Dagu Rice Noodle Markham, food blog, foodie, Mango Yakult, Markham, Passionfruit Green Tea, popular rice noodle franchise from China, restaurant review, Rice Noodle in Soup, rice noodles restaurants in Markham, Signature Rice Noodle Soup with Braised Bone-in Pork, Sour & Spicy Flavoured Crossing the Bridge Rice Noodle Soup with Beef Slices, unlimited rice noodles. Bookmark the permalink.